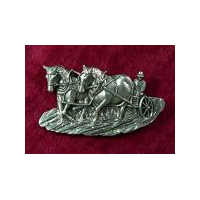 RJ444 - Draft Horse Plowing Buckle - Solid Pewter. The buckle is designed to fit a belt that is 1 1/2" to 1 1/4" in diameter. The oval is about 3 1/8 X 2 inches. 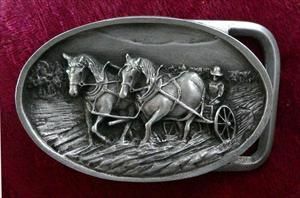 This is a wonderful buckle by James Edward Boyle. Jim carves his designs from real photographs and live models. This nice traditional team of work horses could be plowing, cultivating or raking hay! 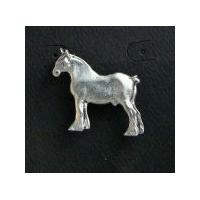 This would be a great buckle for Haflinger owners too! 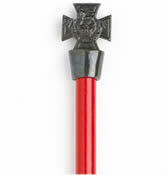 This is a limited edition piece so purchase now and get a low number of the 2500 that will be cast. 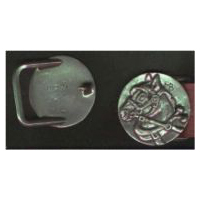 This buckle is designed for the active man or women so it should hold up to years of wear. The buckle is cast in high quality jeweler's pewter not cheap, pot metal like so many buckles. This lead free pewter contains 2% real silver which gives it hardness and helps it hold its shine! The buckle is designed to fit a belt that is 1 1/2" to 1 1/4" in diameter. The oval is about 3 1/8 X 2 inches. These would make excellent trophies for your county fair or plowing match! Wild West, SASS, Rodeo, Western Expansion.